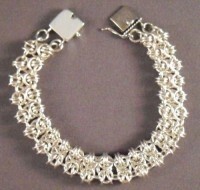 The Honeycomb Bracelet is a very neat and tidy weave. It has a good presence on your wrist. The weave is flexible but can be challenging to make. I especially like the tri color bracelet shown in the pictures with the all sterling bracelet. It is an intermediate weave. The clasp is not included in the kit.